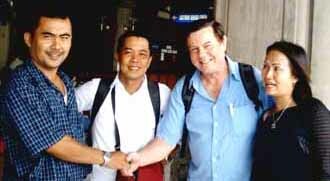 The intrepid travellers John & Jamal are now back home in Bali after their grand Malaysian and Thailand tour. The tripsters departed Bali on Jan 19 for the 3 hour flight to Kuala Lumpur with the Malaysian no-frills airline Air Asia. A$70 ow. 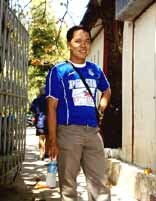 Every Indonesian departing Indonesia must pay Fiscal Tax of A$150 plus the normal A$15 departure tax. 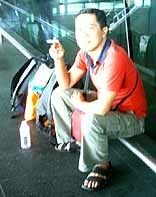 The Air Asia flight departed on time and we arrived in Kuala Lumpur International as scheduled at 5pm. 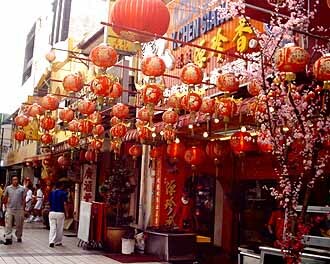 As usual when we are in KL we stayed at the China Town Inn right in the centre of Kuala Lumpur's China Town area. We stayed 2 days in KL relaxing and enjoying old favourite restaurants plus a new one, the West Lake, just on the edge of China Town, excellent and reasonable. It was also a chance to pick up some books at "Popular" English bookshop. China Town was looking particularly festive, with all the decorations already up for Chinese New Year at January's end. Saturday Jan 21, it was off on the 74 km, one and a half hour, long haul back out to Kuala Lumpur airport for our 1 hour 45 minute Air Asia flight to Phuket Island in Thailand. We arrived in Phuket at 1 pm and headed by local bus down to Phuket Town, the original settlement on the island, built with a great deal of influence from the Portuguese. In Phuket Town we stayed at the Historical 80 year old "On-On" hotel which featured in Leonardo di Caprio's ill fated film "The Beach"
In the film the hotel was depicted as a backpackers hotel in Bangkok. 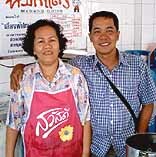 Street vendors and vehicles were bought down from Bangkok to make the scene look authentic. For breakfast and lunch we ate at the On-On Cafe, very good value. Breakfast or lunch for 2 cost around A$4. A little up the road was an authentic Italian restaurant actually run by an Italian. I had Pizza and Jamal Spaghetti Bolognaise, with a ½ litre of red wine the bill came to A$24. Down the road is a street with a few bars, we dropped in at Michael's sports bar, which had very cold beer, (A$1.70 sml) cable Tv and internet. The city has few tourists, we liked it so much we returned for another night to recover after the over commercial Patong Beach. The next morning we took the local A70 cent bus to Patong Beach, 15 km from Phuket Town. Patong Beach is beautiful - that's if you can see it for all the tourists sun baking on rented plastic beds under beach umbrellas. 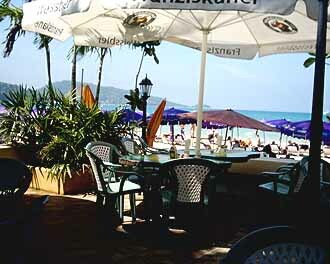 Patong is very popular with German tourists as well as smaller number of Australians. Phuket has certainly made an excellent recovery from the Dec. 2004 Tsunami, I have never seen so many tourists in my life. Patong was expensive after staying at the On-On hotel where we paid A$10 per night. 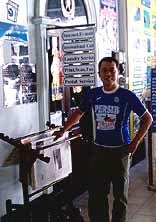 At the tourist Patong information desk we were quoted anything from A$60-$300. Finally we found a small place half way from the beach to the nightlife area called Nacy Best Guest House, run by Nancy Charkit. Nancy's place features a bar, but no breakfast. A few doors down is the Paradise Bakery which does a full American breakfast for A$4. The room was fine, with a fridge even, and cost us A$28/night. Nancy is very friendly and tells every guest her entire life story and about the problems she has with other tourists. She reminded me of a landlady I once had. She spends most of the day trying to sell tours to guests - many take advantage of the offers, just to give Nancy a break. Looking back to the beach from the point the Tsunami came to. After already 5 days on the road Jamal washed our clothes and hung them out the front of Nancy's guest house, fortunately she didn't see them. We no doubt would have got a subtle lecture. Patong has lots of great restaurants, outside and inside, many German, where you can get authentic German sausage with sauerkraut for around A$3.50. Paradise complex, the place was huge and the food excellent. Dinner for 2 cost us A$10. This creative businessman has called his rent-a-car business, Tsunami Rent-a-car. I wonder if the cars float? The night life in Patong is all that you have ever heard and more. As KHO News has a G rating we will have to skip the details. Although Jamal did manage to pick up a cat. 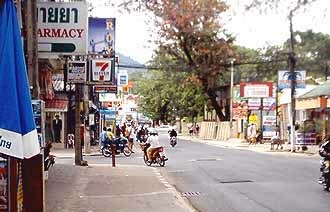 After 4 nights in Patong we returned to the calm of Phuket town to sleep and dry out before continuing to Surat Thani. 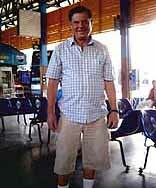 We departed from the Phuket Town bus station for the 5 hour A$6.50 local bus to Surat Thani. The bus was modern, with A/c and had the mandatory extra loud music. I ended up stuffing toilet paper in my ears, Jamal just turned up his walkman. Surat Thani is not a town many tourist stop at. Backpackers travelling through go straight to Ko Samui Island. However as we are travellers with more time than money we decided to spend the night there and break our journey. Jamal was wrapped because he found the local shopping so cheap after Phuket. We booked into the Thaitani Hotel just opposite the bust station in the town centre. 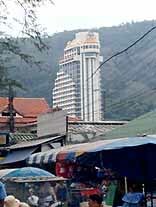 The Thaitani is a Chinese style hotel and has seen better days, but it was clean and cheap at A$9 per night. In the centre of Surat Thani there is a modern department store with a Pizza Hut and an Ice Cream parlour. We found a nice local cafe just near the hotel. Dinner cost $6. Surat Thani is not exactly a place you would plan to visit and definitely way off the tourist map, however the people were very friendly and it was nice to get amongst some real locals. 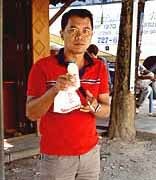 We bought our combined bus ferry ticket for A$6 and departed for Donsak, the port where the car ferry departs for Ko Samui Island. The ferry was very clean, complete with a restaurant and foot massage. After a two and a half hour journey, we finally arrived at the Ko Samui port town of Nathon. After a lot of haggling we found a car to take us around to the major beach resort of Chaweng. Jamal found us a nice little bungalow only 50 meters from the beach for just A$14 per night. 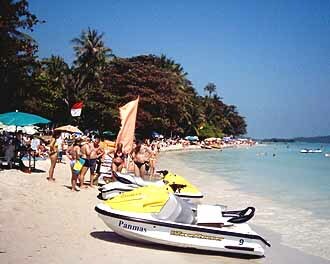 Chaweng Beach in Ko Samui is a far quieter location than Phuket, there are many bars, some with bands, but not the explicit entertainment offered in Phuket. we could ask if the other had returned, saving a walk all the way to the bungalow on the beach, find it locked and have to return miles back to reception to get the key. Chaweng was far more conservative than Patong Beach in Phuket, although they have excellent restaurants and the prices are cheaper than Patong Beach. There are a number of bars, some with live music. On Saturday night we went to a pub to see the show all Chaweng was talking about, "Legends in Concert", featured entertainers from Germany, Philippines and Thailand impersonating famous legends. All sang live, backed by a 7 piece band and 2 singers. 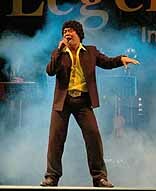 The star of the show was Richie Nelson, Ko Samui German expat who is famous for his Elvis impressions. We were treated to a performance from Elton John. The guy was not that convincing, but boy he could play piano. 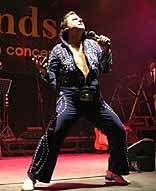 Perhaps better than Elton himself. After the show, we met the American Promoter Jack and Ritchie Nelson, they plan to take the show on tour through asia. The show started at 9 pm, there were two performances, we loved the show so much we stayed for the second performance. 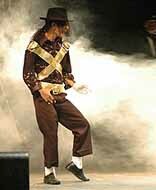 The best act had to be Michael Jackson, the Filipino guy was a great dancer and sent Michael up beautifully. After 3 nights in Chaweng Beach we returned to Nathon, Ko Semui's port town for the night before catching the ferry back to the mainland. We found a nice little restaurant on the foreshore with a pianist, Jamal couldn't help himself and entertained the crowd. 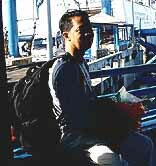 Next morning we boarded the ferry for our return to Surat Thani. We spent the night again at the Thaitani Hotel in Surat Thani before heading on our next leg south to Hat Yai, just 30 km north of the Malaysian Border. We always travel light and limit our baggage to a small backpak. We take minimal clothes and wash along the way. Best when you leave home, the backpak still has room for shopping along the way. We always carry whisky for our cocktail hour - in many places it is either not available or too expensive. 100 Pipers cost A$9 per bottle. Johnny Walker sells for A$12. In Malaysia whisky is expensive and hard to find, best buy before entering the country. information, essential in non-English speaking countries, especially when you can't even read a newspaper headline. We usually wash clothes every couple of days. It is difficult to dry clothes in aircon rooms a ceiling fan room is far preferable and cheaper. Everyday we sent news of our travels back home to John's mum via SMS. Pre-paid SIM cards cost around A$4 in Thailand. Hat Yai, southern Thailand is near the boundary to Malaysia. 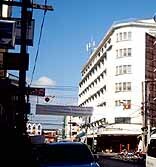 With a population of 160,000 Hat Yai is the biggest city of the Songkhla province. The city is served by the Hat Yai International Airport. It is also connected with the southern railway line from Bangkok, which continues through Malaysia to Singapore. 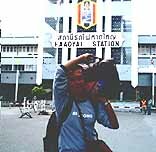 Hat Yai Railway Station, the largest station is an international railway station in Southern Thailand. It handle 28 passenger trains per day. 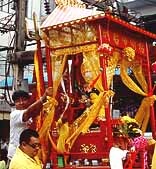 Demographically, Hat Yai is notable for a higher proportion of Islamic and ethnic Chinese citizens than other cities of comparable size in the northern regions of Thailand. 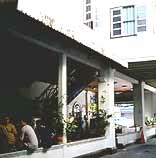 Hat Yai is a popular tourist destination for Muslims from Malaysia and elsewhere who want to escape the pressures of Islamic society. 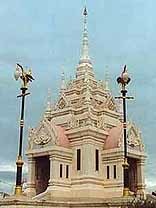 Originally named Khok Sa-Met Choon, Hat Yai was a small village until the southern railway was built there. On April 3, 2005, two bomb attacks on a Carrefour hypermarket and Hat Yai International Airport were done by Pattani separatistic terrorists. The attacks killed two people and injured dozens. We knew little of Hat Yai except for it being the rail junction of the eastern and western Malaysian lines. 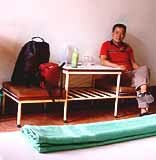 Even 30 years ago in my backpacking days we always avoided it because of the problems with the Pattani separatists. When we arrived we were surprised to find a modern city complete with shopping centres and endless night spots and restaurants. We barely saw any western tourists however the place was packed with Malaysian tourists coming to celebrate the Chinese New Year. 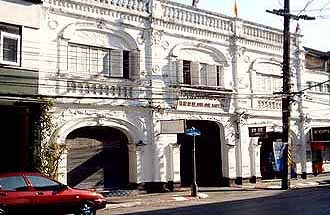 We checked into the Laemthong Hotel, just down the road from the rail station. We had a nice room with a bay window on the 4th floor with Tv, b'room and fan for A$12 per night. We only planned to stay in Hat Yai one night then head back to Malaysia by train to Penang. We liked Hat Yai so much we decided to stay on for 4 days and skip Penang altogether. 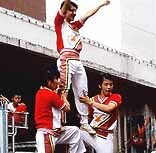 An added bonus Chinese New Year celebrations were in full swing. In the rail pioneering days the city buildings were built of wood. The town also has a few remaining Portuguese style shop houses. Night life is vibrant with a number of bars featuring live music. Prices are very reasonable compared to the western tourist spots. John & Jamal at "The Pub"
Each of the 4 nights we were in Hat Yai we went to a different bar, often I was the only European. We were lucky enough to be in Hat Yai for the Chinese New Year Celebrations - on the Sunday there was a huge street parade complete with extremely noisy fireworks. 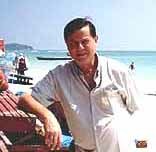 The last leg of our holiday was to take the Malaysian "Lankawi Express" from Hat Yai to Kuala Lumpur, where Jamal would return home to Bali and John would travel home to Melbourne, Australia, via Singapore and Brisbane. When we arrived at the station for the 2.40 pm departure, we were surprised to find our train was only 2 carriages, our 2nd class sleeper and a 2nd class seat carriage. 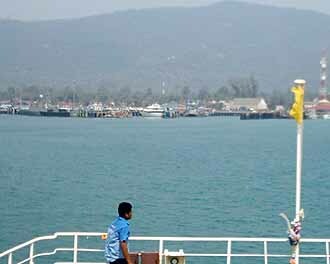 We were aware that the 30 km from Hat Yai to the Malaysian border was a dangerous area due to the Pattani separatists. It was explained to us the rest of the train would join us at the Malaysian border. 14 fully armed military guards boarded our 2 carriages between Hat Yai and the border town of Padang Besar. We were forbidden to take photo's of the armed guards, but I can assure you they looked a mean lot. In no time we arrive in Padang Besar, our armed guards left us, we went through Immigration. Soon our 2 carriages were attached to the Lankawi Express and we were off to KL, by this time it was cocktail hour, we celebrated with a drink inside our curtained cabin. The night train to KL takes 14 hours and cost A$19.50 2nd class sleeper. On the way was some great scenery and a magnificent sunset to end our three week trip.